You could say the essence of solving a puzzle is imagination with a purpose. One takes a series of small steps, calculated to some degree but with room to fully explore. Finding the solution takes logic and creativity. Ingenuity is an embrace of both, as proven in the work of Dalhousie alum Erik Demaine (BSc’95). When Erik was a young boy puzzles were his play. At six, he and his father Martin even designed their own puzzles and founded a toy company in Halifax, N.S. called Erik and Dad Puzzle Co. Homeschooled by Martin, an inventive artist, Erik excelled in his lessons and began teaching himself. Soon after he enrolled at Dalhousie University. Erik received his Bachelor of Science degree in Computing Science at age 14 — a program then offered through the Department of Mathematics, Statistics and Computing Science. A few years later the Computing Science division moved to the newly formed Faculty of Computer Science. Now 37, Erik is a global leader in mathematics. Computational geometry and origami are among the many research interests he has explored during his 17-year career as a computer science professor at the Massachusetts Institute of Technology (MIT). 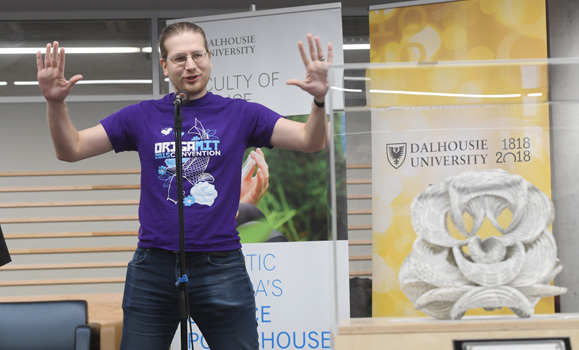 He returns to Dalhousie this Thursday (March 8) to judge this evening’s Three Minute Thesis competition, deliver a lecture and give a unique gift to the university for its bicentennial celebration. Erik and Martin are well-established origami artists who let mathematics and computer science guide their approach to the craft. Together they created one of their signature curved-crease sculptures to honour Dalhousie’s 200th anniversary. 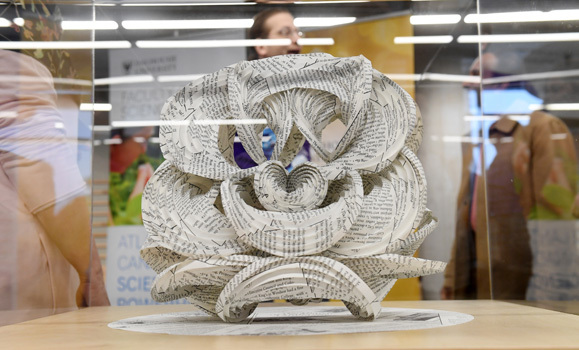 Aptly named 200 Circles, the sculpture uses a montage of pages from The Lives of Dalhousie University Volume One, written by Dal historian P.B. Waite. To design 200 Circles, the Demaines chose to work with prints of the book’s chapter headings, which briefly describe early eras in the university’s history. To name their work of art, they took inspiration from the rings that mark a tree’s age. The construction of a curved-crease sculpture requires patience and delicacy. The artists fold along a pattern of concentric circles scored on to a circular sheet of paper with a hole in its middle. 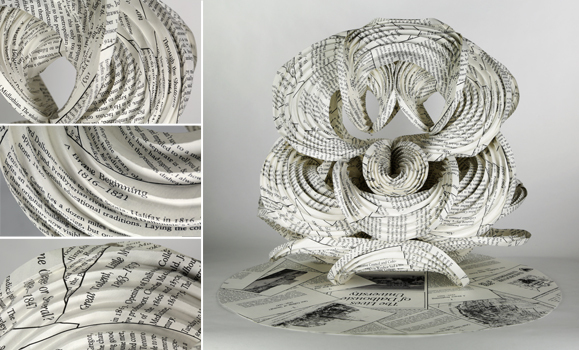 When manipulated this way, the paper curves naturally and transforms into a three-dimensional shape with new properties. Reminiscent of the Bauhaus design movement, 200 Circles represents the interconnectivity of visual arts and mathematics. 200 Circles will be on permanent display in the heart of the Wallace McCain Learning Commons, a student-centric space on Studley campus. Although he took math and computer science courses during his Dal degree, his interest in computational geometry started when he met oceanography professor Chris Beaumont. The 13 year old (left) soon joined Chris’s lab and got to work. He had to figure out how to represent the geometric shapes of tectonic plates for computer simulations. 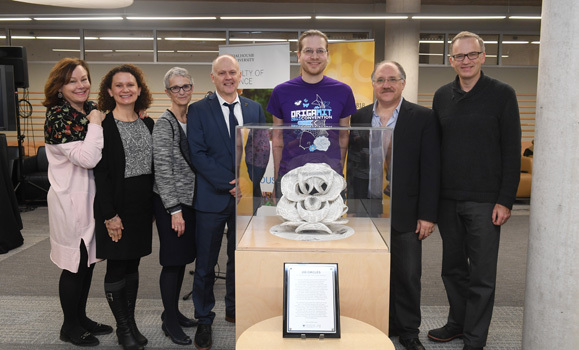 When Erik began his doctorate studies at the University of Waterloo he focused his work on computational geometry and continued to collaborate with the Dalhousie Geodynamics Group. Professors that taught or worked with Erik at Dal share many of the same opinions: he was a fun, motivated student often found hanging out with friends in the basement of the Chase Building. Srini Sampalli, a professor in the Faculty of Computer Science, supervised Erik’s honours degree research. Computational origami covers how to analyze and design folded structures. Specify the shape of the object and a computer algorithm will generate a pattern outlining where to fold a flat sheet of material to achieve the desired outcome. The numbers that explain the curved-crease model used in Erik and Martin’s sculptures are a conundrum, however. But having mastered many puzzles before, the father-son team is determined to solve this one. 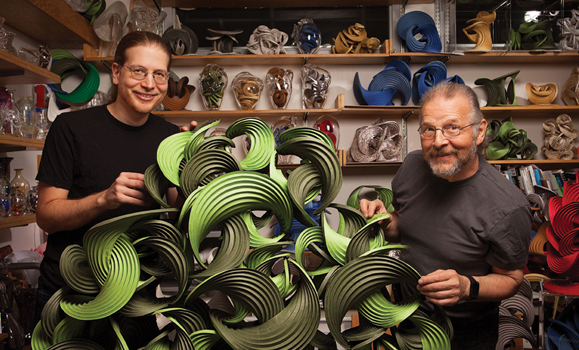 Erik and Martin want to better understand that geometry intuitively through the creation of sculptures like 200 Circles. “We hope we can eventually translate that intuition into a real mathematical understanding,” says Erik. More of their sculptures can be found in New York’s Museum of Modern Art and the Smithsonian. The application of origami folding principles is becoming more abundant in science, engineering and medicine. For example, the aerospace industry is attracted to the concept of folding a sheet of light-weight and low-cost material into 3D technology. A compressed package is far easier to travel to space with, after all. Erik’s findings have been used to design the airbags folded away in cars and now he’s working with robotics — a specialty of the Computer Science and Artificial Intelligence Lab at MIT, to which he belongs. 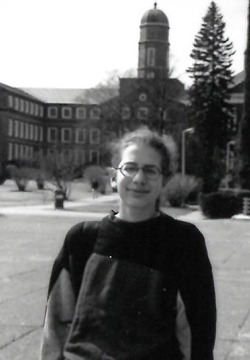 So how does a MacArthur “Genius Grant” recipient and former child prodigy decide what to study? “You’ll definitely notice the kind of fun spirit in a lot of the things I choose to work on. Some are less obviously fun, but they’re fun for me,” says Erik. When pondering where technology could be 200 years from now, Erik doesn’t speculate. The most accurate prediction, he says, is that we have no idea what it will look like. “I’m also not worried about robots taking over the world,” he says with a laugh. Erik and Martin’s approach to problem solving is one of elegance. The simplicity of blending ideas from both the left brain and the right removes an unnecessary division, allowing space for thoughts to move in harmony. Society is entering a new era of scientific advancement, one where innovation will flourish when lines between methods, experts and perspectives are blurred. Dalhousie will be a part of this transformation, with collaborative interdisciplinary research initiatives like the Ocean Frontier Institute fuelling an increased understanding of our world. When you walk past 200 Circles someday, take a moment to admire the transformation it underwent to go from two dimensions to three. In a way it symbolizes a new dimension of Dalhousie’s story as its third century rises above the horizon. Left to right: Catherine Bagnell Styles (assistant vice-president, Communications and Marketing); Sheila Blair-Reid (executive director, Alumni Engagement); Carolyn Watters (provost & vice-president academic); Chris Moore (dean, Faculty of Science); Erik Demaine; Andrew Rau-Chaplin (dean, Faculty of Computer Science) Richard Florizone (president).